I read Mystic River years ago and fell in love with Dennis Lehane's writing. His characters were so real and fleshed out that I felt I could reach out and touch them. I liked everything about the book: from the tone to the setting to the complex story line. I knew I wanted to read more by the author but wasn't sure if Shutter Island would be the best place to go next. The movie coming out decided for me. Only, it's taken me awhile to get around to actually reading the book. When the movie buzz was high, praise for the book was immense. But I remember when the book first came out, there were quite a few mixed reviews. Shutter Island is no Mystic River. It is different from the previous books the author had written in many regards, and so that is to be expected. It shares some of the same characteristics, however. Both Mystic River and Shutter Island are dark and brooding. The characters are deeply troubled, haunted by their pasts. 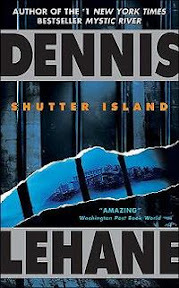 Set during a hurricane on an island, at a mental institution for the criminally insane where the most violent perpetrators are housed, Shutter Island has all the elements of a good thriller novel. The year is 1954; World War II has long been over, but the scars remain. The setting of the story is significant. The 1950's were an interesting time in U.S. history. McCarthyism was strong and the controversy around certain psychiatric treatment methods was beginning to come to the forefront. Psychiatry back then was highly experimental; new drugs were being tested and lobotomies were in vogue. The novel opens with Marshal Teddy Daniels and his new partner Chuck Aule's arrival on the island. They were sent to investigate the disappearance of a patient, Rachel Solando, who mysteriously disappeared from her locked cell. As the story unfolds, it is clear there are dark secrets being kept at Ashecliffe Hospital. Teddy's ghosts revolve around his late wife, his guilt over her death and is not being there for her when she needed him most. It colors his thoughts and actions throughout his investigation, coming in the way of flashbacks and dreams. This is actually a difficult book to summarize in that to give too much away is to take away from the suspense of the story. It's got several layers which make it all the more intriguing. I was less enamored by Shutter Island than I had been by Mystic River, but I still enjoyed the novel quite a bit. It got off to a slow start but grew in intensity. The movie followed very closely to the book, with only minor changes. This is one of those cases where not knowing what is going to happen has its advantages, and yet knowing, I was able to make out little details that I perhaps had overlooked in the book. The island was much more beautiful than the one I'd created in my imagination, and I easily bought into Leonardo DiCarpio as Teddy Daniels. I never tire of seeing Ben Kingsley and Mark Ruffalo in movies, and this instance was no different. The movie pulled off the tone and sort of gothic feel that was also in the book. And while the story itself is good, like with any Lehane story, it is the characters that make it all the more rich. This is true for both the book and the movie. In the movie version, I got a stronger sense of Teddy's past as a soldier, about his memories to the war than I did while reading the book. It's hard to imagine anyone seeing what he did come out unscathed. It carries over in his suspicions of experimentation at the mental facility. I was impressed too with how well the flashback and dream sequences were played out. They generally come off as cheesy in movies, but they were very well crafted in this film. The fit the tone and helped move the story along. Like with the book and movie of Mystic River, I find myself at a loss to say which is better in the case of Shutter Island. I enjoyed both equally. Source: My boss loaned me her copy of the book (although I do own my own copy, which I purchased years ago). The movie was a rental from Netflix. Great review, Wendy! This is the first book I read by Dennis Lehane and definitely not my last! I loved the movie too and I think the cast had all done a great performance in portraying the characters. I can't wait to read "Mystic River" as I heard nothing but raves about that book! I love LeHane's books and looking forward to the new one coming out soon (?? forget the title). Shutter Island, book and movie, were awesome in my opinion. I listened to the audiobook first and then saw the movie. You're right. I think they were equally good. I haven't read the book or seen the movie, but both would be great for the R.I.P. challenge. After reading your review, I'm going to add the film to my Netflix Que! I love Mystic River too, so I've been interested in this book and movie. I'm glad to see they're both so good! To me, the movie was right on the mark until that last line, which changed the whole thing. I was aghast! Who ALLOWED Scorcese to do that? I was all up in arms. I think the change made a better story, but still, they changed the essence from the book. This audio was great. I will never forget how it impacted me. After reading Sandy's great reviews on the movie and book, I went out and experienced both of them for myself. This was my first experience with Lehane, and I thought a lot of what he did was brilliant and very troubling. I also thought that the last line of the movie really changed things between the book and the movie, but overall, I was satisfied with both of them. Great review! I will have to try more by Lehane! Enjoying both equally says a lot about the producers ability to translate the book into a worthwhile movie. I will be checking out this book to read before I watch the movie!! I don't think I can go wrong!! I saw the movie and loved it but still need to read the book. I also saw Mystic River and need to read the book. Hopefully my seeing the movies won't ruin the reading experience for me. Have you seen Gone, Baby, Gone? I thought that was a nicely done movie. I didnt' realize Mystic River was a book, the movie made me cry. I need to read Shutter Island, I enjoyed the movie and think it was cast perfectly. Glad to hear the movie stood true to the book. I've seen the movie - twice - and have yet to read the book :( This is NOT my typical approach. I still have dreams of reading the book on Friday/Saturday and re-watching the movie on Sunday and compare them. You did a marvelous job of doing that in this review! I just read this book liked two weeks ago! I thought it was very good. Issac read it as well and we are anxious to rent the movie. Maybe this weekend! I haven't read any of Lehane's books and I don't know why. I have watched Mystic River many times and mean to read the book.... I enjoy thrillers and suspense books and I know he writes in a style I really like. 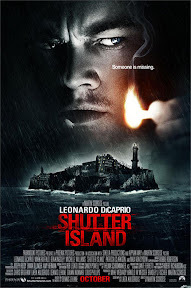 I have heard many varying opinions about Shutter Island, the book and the movie so I was happy to see your review here...an opinion I can trust! I love your enthusiasm for Lehane and I've now added Shutter Island and Lehane's name to my TBR list and hope to start reading his books soon. I am curious about this one but I'm honestly not sure if I'll ever get around to watching or reading it. My husband said he liked the movie though. Great post! Thanks a lot Wendy! I've read the book, and I have the movie here waiting for me. As always, I don't jump right into the movie if I liked the book (which I did). But thanks you for your post because now I want to watch it sooner rather than later. So I think I'm going to read this at some point and I probably should save Mystic River for last. Excellent review, Wendy! I loved this book and I especially love the twist at the end. I want to read more of Lehane's books. Melody - Thank you! The director did a great job with the cast for the movie. I do hope get a chance to read Mystic River. I think you'll like it! Diane - I saw your review of his new one. I need to go back and read his series' books. I've heard such good things about it. Stacy - It's hard to choose a favorite of the two, isn't it? I like it when a movie turns out to be just as good as the book. Jenclair - Yes, these two are perfect for the RIP Challenge! I hope you get a chance to see the movie soon! Kay - I love his writing. He really gets into the minds and hearts of his characters. I don't think it is all that scary, so I think you're safe. :-) It's certainly intense in spots though. Kathy - I look forward to reading your thoughts on both if you get a chance to read/watch them. Sandy - I've heard that from others too about that last line. I actually liked it a little better with it. Zibilee - Hmm. I didn't get that same impression about the last line, that it changed everything. It added a new dimension to think about, yes, but for me it didn't change everything. I guess I can see how you and Sandy might feel that way though. I agree that Lehane is brilliant. I look forward to reading more by him in the future. Staci - I hope you will enjoy them both, Staci! You can't go wrong with Lehane. Charley - I have seen the movie, Gone Baby, Gone. It was a great film! I do need to read the book though . . .
Naida - Thank you! Mystic River made me cry too--such a good book and movie! Molly - Haha! Well, there's a first time for everything. :-) I do hope you get a chance to read the book one of these days. Amy - I'd be interested to know what you think of Lehane when you do give him a try, Amy. Mystic River is such a good book--so many different layers. Shutter Island is good too, of course, but I'll always come back to Mystic River as being a favorite. Jen - So many books . . . If you do get a chance to read/watch it, I hope you will enjoy it. Christine - That's probably smart, not jumping into the movie after having just finished the book. I should follow that advice more often. I have so little patience when it comes to that though. Lisa - Save the best for last. :-) Sounds like a good plan. Alice - Thank you! Definitely do read Mystic River!